Laying track curves when model railroading may seem like a simple issue, but there can be much more to the skill than meets the eye. People new to model railroading are sometimes unaware that model train track curves are sold in various radii that allow users to fit different spaces and to run tracks parallel to one another. Two geometric terms are crucial to understanding how to work with curves when planning your model train tracks: radius and arc. In geometry, a radius is the line segment from the center of a circle to any point on the circle itself. Smaller circles have shorter radii (the plural of radius is radii). The image at the left shows curved sections of Kato Unitrack in four different radii. Kato actually offers curved sections in seven radii, one smaller and two larger than the radius shown here. The term arc refers to the segment of a circle and is expressed in degrees. An entire circle has an arc of 360 degrees, so half a circle is a 180-degree turn—the arc necessary to turn a train around to face the opposite direction. The curved pieces in this photo each have an arc of 45 degrees. Depending on scale and manufacturer, track pieces may be found in 15-, 22.5-, 30-, and 45-degree arcs. Track curves can be used to break up the monotony of long straight sections of track by introducing curves, but their real utility is in turning trains around in the opposite direction. For best realism, the rule of thumb in model railroad track layout has always been to use the largest radius curve that you can. For experienced model railroaders, this is an automatic reaction—to look at a table and other flat surface and to instantly begin thinking about the largest radius curve that will fit on it. Generally speaking, use curves with a radius of 18 inches or larger in HO-gauge trains, and a radius of 11 inches or larger in N scale—if there is space, that is. What if the available space is a narrow space, such as 2 x 5 feet? Many experienced modelers would say that such a space is suitable only for a switching—a layout with no 180-degree turns at all. On switching layouts, trains can only run back and forth. When forced into this configuration, modelers generally create a scenario that simulates how a train would operate when picking up cars from an industry—such as hopper cars being filled at a grain silo. Some hobbyists very much enjoy this kind of modeling. For those who really want a continuous loop layout in a small space, despite the fact that it may not look prototypical, then minimum radius becomes very important to you. Despite the traditional rule of thumb, there is no reason you can't create a full 180-degree turn, provided the minimum radius makes it possible. And when introducing a child to the fun of model railroading, rules aren't the most important thing. The smallest space a train can turn is referred to as its minimum radius. When choosing a scale in model railroading it is important to remember that the larger the scale, the larger the minimum radius for your curves will be. This chart shows the minimum curve available in various scales from different model railroad track manufacturers. In geometry, the diameter is the line segment that bisects the entire circle and is therefore twice as long as the radius. When planning space to turn your trains around, remember that the radius given by the manufacturers is usually measured from the center of the track, not the outside edge. This means that adding the overall width of a track piece to the diameter is an important part of properly calculating the space needed to turn a train around. Find manufacturers who offer N-gauge track curves that are tighter than the 11 inches most enthusiasts view as the minimum radius for realistic modeling. For example, Kato offers 8.5-inch radius curves, and the Japanese manufacturer Tomix offers N scale minimum curves of 103 mm radius or 4 inches. Serious model railroaders usually regard these as much too small for their layouts. For children being introduced to the hobby, these tight curves may allow them to be much more creative in laying out track on an under-the-bed board—assuming, that is, that the train cars (especially the locomotive) can handle the turns. For navigating tight turns, the primary concern is the wheelbase of locomotives and rolling stock. The tightest track curve Kato manufactures for their N scale Unitrack has an 8.5 inch radius. This means that it's possible to fit an oval of Unitrack in a space as tight as 18 inches, or a double track in an area with a width of about 22 inches. However, Kato warns you that six-axle locomotives won't be able to navigate the 8.5 curves. Make sure to consider this fact when matching locomotives and other rolling stock to your track layouts. Don't waste your money buying big modern diesels or long, articulated steam locomotives, only to face the disappointment of them derailing on curves. If a track configuration is limited with tight, short-radius curves, short trains pulled by smaller steam locomotives, or short lengths of modern cars pulled by a switcher, will work fine. 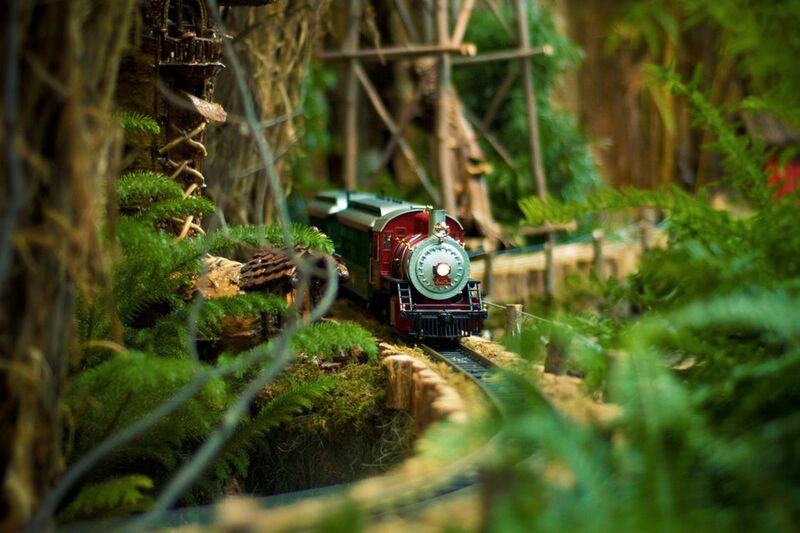 For those new to model railroading, don't be in a hurry to glue down the track and start landscaping. Throw out buzzwords such as "prototypical scale model," and remember that these are toy trains that are meant to be played with. Change the track around and experiment. Discover what works and what doesn't—and what configuration is preferable. Use a segmented track for this experimentation—preferably one with an integrated roadbed. If and when you get around to building a permanent layout, you may want to change from segmented track to flex track—but everything you learn about curve radius and arc will still apply. Granted, very tight turns do not always look prototypical and realistic, but if the unusual look of tight turns is bothersome and there is no space to widen them, camouflage the curves with tunnels and narrow canyons. The N-Scale layout shown here has a simple track plan using a tunnel and mountain to hide the curves and divide the scene. When hiding tight curves, don't forget the limitations imposed by them. Camouflaging doesn't allow a run for six-axle locomotives—it just makes the trains that are able to run look more realistic. In any case, remember to never let other people's opinions spoil your fun. An easement is a track laid in a parabolic curve. Usually, easements are made with flex track, but they can also be simulated with segmented track pieces. Easements will increase the width of turns a bit, but they will also make the layout look a little more realistic and operate more smoothly. Now that the basics of curves, including the implications of tight minimum curves, have been laid out, the next concept needed to familiarize oneself with is the issues surrounding steep maximum grades.